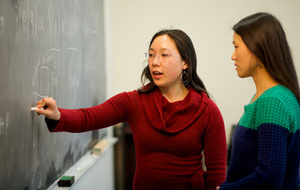 First year applied and computational mathematics and statistics graduate student Claire Chow was recently selected as a Microsoft Research Graduate Women's Scholar. The program is a one-year scholarship program intended to increase the number of women pursuing Ph.D degrees. Chow will receive a scholarship to use towards her second year of doctoral studies and an additional $2,000 travel grant to attend a conference of her choice. The scholarship process was highly selective, with only 10 present of applicants successfully receiving scholarships. As the era of information and technology continues to dominate, big data — data that requires new forms of processing due to its extensive volume, velocity, and/or variety of information — offers tremendous benefits for education, economics, medical research, national security, and other areas through data-driven decision making, knowledge discovery and process optimization. However, one of the crucial concerns is the extreme risk of exposing personal information of individuals who contribute to the data when sharing it among collaborators or releasing it publicly. Chow's research focuses on statistical disclosure limitation (SDL), or methods of data privacy and confidentiality. She is developing a technique that will preserve participant privacy without altering the integrity of the original data by creating multiple, synthetic data from predicted values using Bayesian Statistics. The goal is to allow many entities — such as national security agencies, hospitals, and educational institutions — to use shared big data to make better decisions, discover new correlations, and optimize their systems while practicing discretion and maintaining trust with research participants.